Now that you have vCenter Log Insight deployed and configured, you need to configure sources to send their log messages to Log Insight. If you enabled vCenter Server integration then you should start to receive log messages, but this is only the beginning of configuring remote syslog sources. IMPORTANT: Configuring vCenter Server integration does not configure vCenter Server or ESX/ESXi hosts connected to vCenter Server to send remote syslog to Log Insight. For more information continue reading! Let’s start by going over what Log Insight supports today and what mechanisms it has to configure vSphere devices for you. Something that I noticed was missing from William’s scripts was the ability to configure application layer services such as NTP and Syslog. As such, I put together a couple quick scripts shared below. Error 100: Unable to communicate with the remote host, since it is disconnected. mysql_node/54: Unable to communicate with the remote host, since it is disconnected. What was causing the issue and how can it be fixed? During a recent change ticket in a non-production environment I was called into an All Paths Down (APD) situation on some ESXi hosts. For those who do not know what an APD is, it is when an ESXi host loses all paths to its shared storage. 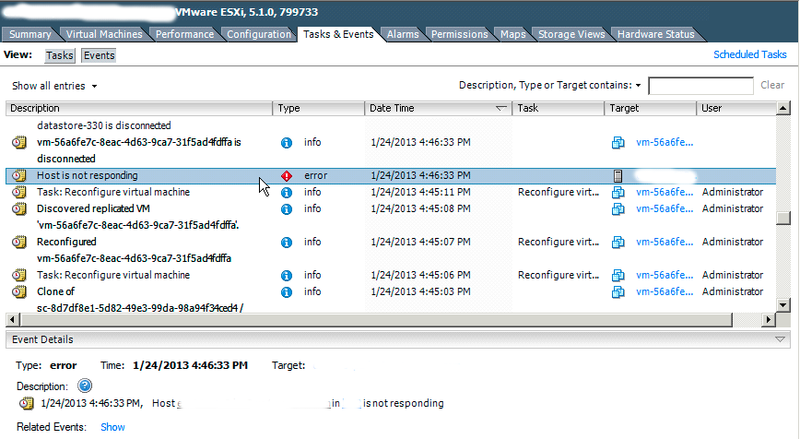 The ESXi hosts impacted in my particular case were hosting several virtual vCenter Server (vCS) instances. The virtual vCS VMs were being used by a group of developers for SOAP calls in order to provision, modify, and delete VMs. Once all the vCS instances had been recovered and vSphere client sessions verified that the instances were operational, the instances were turned back over to development. The developers immediately began complaining about SOAP commands failing to the vCS instances. Cannot complete the configuration of the HA agent on the host. See the task details for additional information. I verified that the hosts were in fact configured identically and then tried to add the host again, but the same error messages were displayed. Based on the error messages, I found the following KB article: http://kb.vmware.com/kb/1019200. Unfortunately, the link did not help. From this error message I found KB article: http://kb.vmware.com/kb/1012154. This article pointed to name resolution (i.e. DNS) being my issue. I know of the importance of DNS with VMware products and was sure I had verified its configuration, but decided to double check. As suspected, DNS was configured and working as expected. This error message pointed me to KB article: http://kb.vmware.com/kb/1003409. Again I tried everything suggested and was still receiving the same error message. At this point, I was frustrated. I decided to reboot the server just in case that fixed the issue. Upon restarting, the error message want back to the vmodl.fault.HostCommuncation one. What was going on and how could this be fixed? Another interested VMware problem today: I attempted to put a host into maintenance mode, but after making it to 60% the operation failed. The error message displayed was: Operation timed out. Trying again, I ran into the same issue. What was going on?